Given the size of Stone Brewing Company (a top 10 craft beer brewery in terms of volume), I've always been surprised at the relatively tiny size of their barrel program. If you troll their BA page, you'll see lots of examples, but from what I can tell, you've got a lot of DONG* beers and limited bottle runs in the low hundreds. In the past few years, though, they've really stepped up their efforts, implementing what they call their Quingenti Millilitre (they come in 500 ml bottles, hence that fancy name) series. Last year, they released 9 different varieties, but no imperial stouts. Their previous attempt to bottle a barrel aged IRS in 2010 wound up horribly infected, so everyone was wondering if they'd try it again. Well they did, and holy hell am I glad I got a hold on one of these bottles, because it is nothing short of spectacular. Bottle counts seem to be in the 3000 range, which is nothing to sneeze at, but given Stone's size, it still seems small. Hopefully their meteoric rise will extend to their barrel program in future years. Beer Nerd Details: 13.9% ABV bottled (500 ml caged and corked). Drank out of a snifter on 5/25/14. Bottled: February 2014. IBUs: 38. There is a version of this beer that also included Ryan Bros. Coffee. That variant is more popular with the general beer nerd population, but while I'm sure I'd enjoy it, I can't say as though I'm that disappointed as I'm not a huge coffee guy (he says, as if he hasn't said it a gazillion times before). 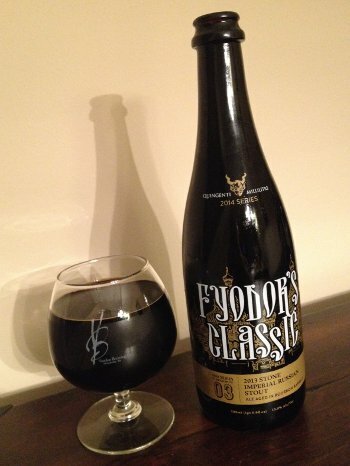 Fyodor's Classic is my sweet spot, and I will be hunting this sucker out again for sure. * Draft Only, No Growler. Aren't acronyms fun? This page contains a single entry by Mark published on May 29, 2014 10:58 PM. Crooked Stave Origins was the previous entry in this blog. Tired Hands Second Anniversary is the next entry in this blog.